Here's why income investors should pay attention to these three dividend dynamos. While large-cap stocks tend to grab all of the financial headlines, we Fools believe that there are plenty of great businesses out there that quietly deliver for their shareholders. Want proof? We asked a team of our Motley Fool investors to each highlight a little-known income stock that they are quite fond of. Here's why they called out Medical Properties Trust (NYSE:MPW), Plains All American Pipeline (NYSE:PAA), and LaMaitre Vascular (NASDAQ:LMAT). Keith Speights (Medical Properties Trust): Tucked away in Birmingham, Alabama, Medical Properties Trust offers a dividend that's more attractive than many more well-known stocks. The company's dividend currently yields more than 7%. Medical Properties Trust is a real estate investment trust (REIT) that leases properties primarily to healthcare providers including general acute care hospitals, inpatient physical rehabilitation hospitals, long-term acute care hospitals, surgery centers, and specialty hospitals. As of March 31, 2018, MPT owned 274 properties, most of which are in the U.S. but also with a significant number in Germany. The company also has some properties in other countries, including the United Kingdom, Italy, and Spain. MPT's top three customers generate roughly 65% of the company's total revenue. That's not a bad thing, considering that the two of them -- Steward Health Care System and Prime Healthcare Services -- rank as the No. 4 and No. 5, respectively, biggest for-profit hospital chains in the country. The company currently uses only 68% of funds from operations (FFO) to fund distributions to shareholders. With demand for healthcare services growing as baby boomers age, MPT's customers should be in solid shape over the long run. That means the company should be able to count on dependable revenue -- and investors should be able to count on dependable dividends. Maxx Chatsko (Plains All American Pipeline): The Permian Basin in West Texas has become one of the most exciting sources of oil production growth in the world. There's just one problem: crude oil and raw natural gas are coming out of the ground so quickly it has overwhelmed the region's pipeline, processing, and storage infrastructure. That creates a sweet opportunity for pipeline operators such as Plains All American Pipeline. The company is among those leading the charge to expand the region's pipeline networks, both within the region and to refineries hundreds of miles away on the Gulf Coast. Drillers don't care so long as the bottleneck gets removed. Plains All American Pipeline -- which boasts a 4.9% yield -- is pouring $1.6 billion into several major pipelines. This year and next the company will add 2.3 million barrels per day (BPD) of new pipeline capacity including 600,000 BPD in the Delaware Basin (where 60% of Permian production growth is expected), an additional 800,000 BPD inside the Permian at large, and another 850,000 BPD in long-haul capacity. There's more coming in 2020 and beyond. The expansion will provide Plains All American Pipeline with ample fee-based growth -- enough to give management the confidence it can grow earnings and cash flow by double digits in each of the next two years at least. That will help the pipeline operator to edge closer to its long-term deleveraging goals while leaving a healthy amount of capital for future growth and dividend increases. If this high-yield stock isn't on your investing radar, then you might want to give it a closer look. Brian Feroldi (LaMaitre Vascular): It can take a long time for a healthcare provider to grow comfortable with using a certain type of medical device. That fact helps to keep them brand loyal for many years after they become trained. After all, why bother learning how to use a competing product if you're not the one that's footing the bill? I saw this strong brand loyalty play out firsthand during the 10 years that I spent selling medical devices in a former job. Since I now appreciate just how high the switching costs can be I've become a big fan of investing in winning medical device companies. One under-the-radar medical device maker that impresses me very much is LaMaitre Vascular. This founder-led business builds or acquires niche medical devices that meet the needs of vascular surgeons during certain types of procedures. The company's decision to focus on niche markets has proved to be a great move for shareholders. The reasons is that these markets are too small to attract the interest of major medical device makers. The lack of competition helps LaMaitre to hold a commanding market position. But how does a company with such a niche focus grow? The answer is to steadily raise prices, acquire complementary businesses, launch new products, and open up new geographies. 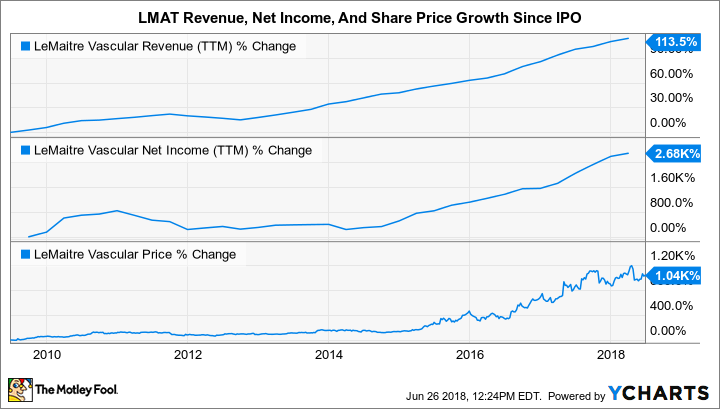 LMAT Revenue (TTM). Data source: YCharts. Looking ahead, I think the odds are favorable that LaMaitre will be able to keep running this playbook successfully for many years to come. If true then the company should have no problem continuing to grow its net income and raise its dividend rapidly. While its current yield of 0.8% might not sound all that enticing, my view is that this business will provide its shareholders with strong total returns when factoring in the growth potential.